At January’s Court, I asked you to take with a blood pressure threatening portion of salt, the results of last year’s online RMS survey, which by its own terms made no attempt to get “a balanced and representative sample”, and included provably false misreadings of its mere 1500 respondents[*]. A true consultation would present the relative merits, pros and cons of its statements, no attempt was made towards this in the survey. Sadly, as another online poll will be used to comment on new RMS proposals, we’re now due to repeat that meaningless exercise this year. There are some good ideas within these proposals[†], but they are incomplete and unfocussed, and very much the result of the messy group think employed. The review of the RMS should have a broader vision, which acknowledges that the complexity of solutions required may need more than 144 characters to express, should include not just the recreation provisions for neighbouring authorities, but strategic review of new development that puts greater recreation pressure on the Forest. This brings housing targets and mitigation regimen across the entire region into the discussion[‡]. This cannot be done in a format more suited to counting how many people like that photo of a fox cub, or if you think that dress is blue/black or white/gold. The future of the Forest, and its millions of recreational visitors, should not be at the behest of an insecure online poll whose unverifiable population is half that of Lyndhurst. We want an RMS aimed at Managing Recreation Strategically to fulfill the Statutory Purposes of the Park, and the legal obligations to protect the designated habitats. We want leadership able to defend that Strategy in a public consultation, even the measures which may not be simply explained, or may need defence against interest groups who would put their needs above those of the habitat, commoning’s working farm and forestry. Please use your seat at the table to stop this important document, and the process guiding it from being dumbed down. [*] One item was interpreted as having “wide public support”, despite only being supported by 22%. [‡] The RMS would need to confront the aspects of the NFNPA and NFDC draft local plans which will pave the way for an inappropriately large development, wholly within the National Park, creating a new population centre of 3500 people (larger than Lyndhurst). Placed 30 minutes down a cul de sac with paltry mitigation for that population which would be dumped entirely on the Forest for Recreation provision, and on the road infrastructure (requiring upgrades that would encroach into the Forest, and greater traffic across animal accident hotspots within the Forest). The Addendum written for the Verderers referred them to the NFA’s response to last year’s Future Forest survey, then included these additional remarks on the latest RMS proposals under our three main areas for specific, achievable projects. The proposals do contain an aspiration to create a map to be used to address infrastructure priorities, but this is given an absurd “quick-win” goal of being produced within a year of the adoption of the RMS update. Rather than specifying key criteria and gathering evidence to base a sound spatial strategy, this will be done with whatever haphazard data is to hand or may be hastily compiled within that timeframe leading to an infrastructure just as damagingly arbitrary as that which we’ve inherited. The proposals limit discussion of influencing adjacent authorities to their recreation provisions, where placement of population increases from new development if often the strongest driver in creating recreation pressure on the Forest. Mitigation regimes use formula developed by Natural England for Thames Basin Heaths, which does not scale appropriately to the Forest because a) the Forest is much richer in features and biodiversity at threat and should cost developers more b) the morphology of the Forest is different: Thames Basin Heaths spatially has greater opportunity for alternative spaces, where the Forest, surrounded, creates more of a siege situation (with only one defence to the West at Moors Valley, and plans to the East eternally pipe dreamed). England Coast Path: What can I do about it? We suggest some representations you might wish to make. And discuss how the format of the consultation is restrictive. First, let’s hunker down on what hoops Natural England have set for us to jump through. There are two types of response you may make, “Objections” and “Representations”, both with different forms to fill out. We have been told that if you do not use the forms for your response, your response may by discretion be ignored (and some have informally been advised that they would be ignored). In some instances you may do both. Where we have proposed (or not proposed) an alternative route (in addition to the ordinary route), or the position of the alternative route or any part of it. Where we have proposed (or not proposed) to extend the route to any point between the open coast and the first public foot crossing point on a river. “Representations” are not limited in subject matter / grounds, and owners/tenants/occupiers may make these as well (and are invited on the forms to identify themselves). Anyone else may also make representations as individuals or group representatives. In both types, multiple forms would have to be submitted if commenting on non-contiguous portions of the route. Each form must identify a single “land parcel” or several adjoining ones. Again, you may choose to depart from guidance, but run the risk of being ignored. 1 & 2. For our purposes here you’ll need to look through Chapters 3, 4 or 5 of the proposals. These 3 Chapters alone propose 114 discrete sections of the route from Lymington Bridge (East) to Calshot (and that’s excluding possible Alternate Routes, which we have little to worry about as in this instance there’s only two bits along public highway from Inchmery Lane to Lepe Road, and Alternate Routes do not create additional Coastal Margin). 54 of those sections aren’t on current established Rights of Way, 21 of these sections classified as “Other existing walked” 33 sections are new “not an existing walked route”. You can choose any of these for comment, I’d suggest an area you know well, or if you don’t know, go for one of the new ROW as these may be the most problematic. For your additional research, I suggest looking at the Government’s Magic Map page http://magic.defra.gov.uk/MagicMap.aspx. This lets you zoom into the area where your route sections are, you can turn off useful layers (layer menu is on the top left of the map ) under Designations / Sites of Special Scientific Interest (England) / Special Areas of Conservation (England) / Special Protection Areas (England) etc, also with useful Marine designations). This is somewhat necessary as the consultation maps do not provide this information in any useful context or detail (there’s one map in the Overview which does not show the route and how it or Coastal Margin interact with the habitat and other designations). 3. Those listed in Schedule 1 Coastal Access reports, those with sport shooting rights and the following organizations: BASC; British Mountaineering Council; Country Land and Business Association; NFU; Open Spaces Society; Ramblers ; RSPB have to identify themselves (as if they were marked! — do you suppose they get a knock on the door asking how they were recruited to these shady organizations?). 5. 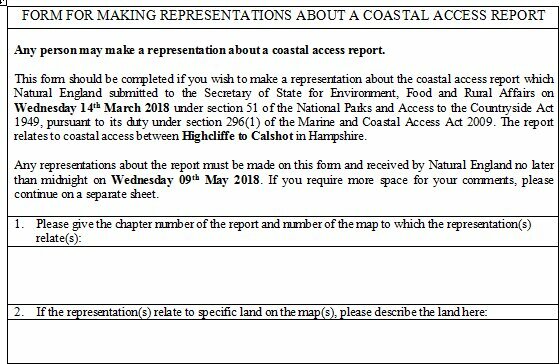 Here’s the real meat of the Representation, what ever concerns you about the report in such a way as to show that it “fails to strike a fair balance” between the provision of Coastal Access Duty and personal, statutory, local or National Interests. National interests would include honouring the protections to habitat in the Wildlife and Countryside Act 1981, and other agreements and law that specify relevant habitat designations. Either think of your own concerns that fit the bill, look through our other articles for extensive critique, and/or use almost any of the points below which sadly will apply to much of the route. The Sensitive Features Appraisal fails to carry out a full Habitats Regulation Assessment to assess impact of this section of the route, route facing mitigation measures may not be presumed to work, and in the context of Coastal Margin which may allow incursion through the Margin from other directions, the proposed mitigation is flimsy. Presumption that this route has no significant impact has not been proven in the absence of the full Habitats Regulation Assessment, or the possibly illegal inclusion of the proposed mitigation at the screening stage. Because of the poor presentation on the maps provided it is difficult to judge the relationship between the route, potential Coastal Margin, excepted land and exclusions. 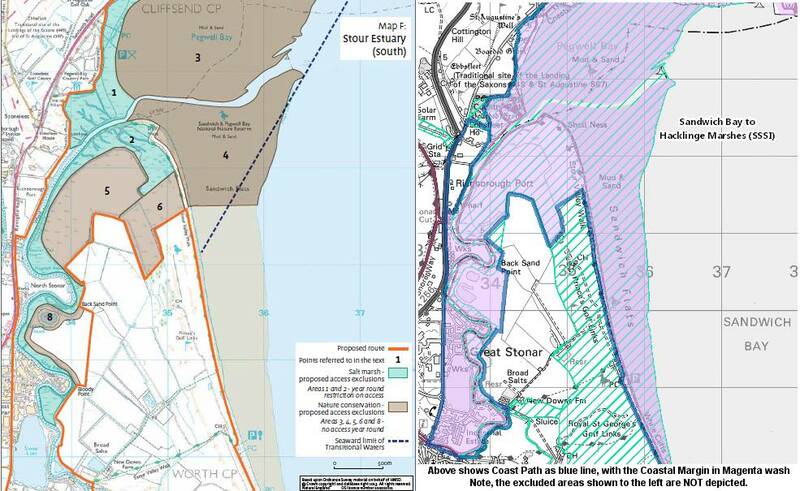 The Ordnance Survey’s practice of showing all potential Coastal Margin as access land will mislead many off this route section onto protected habitats and dangerous salt marshes. Dogs should be on leads for all sections adjacent or through protected habitats, grazing or back-up land for livestock. Using the least restrictive option principle as a standard for the Sensitive Features Appraisal is wholly inappropriate in the context of a National Park. whereas within a National Park, the Sandford principle which favours conservation over recreation where they may not be reconciled is enshrined in the 1949 Act and subsequent Acts. 6 & 7. Self Explanatory, note because you are expected to submit separate forms for each contiguous stretch you criticise, you may have made other representations about the same report. 8. Again, harking back to #4. If you are and owner/tenant/occupier, have you also made out an “objection” form for between 1 and 6 statutorily granted reasons. Now I think it’s worth noting, if you haven’t already caught on, but the format of this consultation is onerous. Some of the questions on the forms themselves require specialist knowledge, or a visit to a separate document that explains some, but not all of the questions. You are told to submit multiple forms for multiple sections. By virtue of the fact that the forms are geared around references to sections of the route, there is no way to identify portions of the Coastal Margin you may wish to comment on, the seaward portion of the Margin is never explicitly delineated on the maps, although there is a useless box, often sitting on the map obscuring features that explains the Margin is the whole seaward side but for Excepted Land and Exclusions, and the maps do not depict these either for reference. The maps do not show the boundaries of legally protected designated habitats, so it is not easy to judge whether the section has an impact. There is no direct way to reference any of the supporting documents. There’s much wrong with the Sensitive Features Appraisal itself, the forms don’t really offer you a way to make those comments. So, if you’ve any spare time between now and Midnight Wednesday 8th of May 2018. Download and fill out the form and email it in. Even if you miss the deadline, keep sending them in with the complaint that an extension to the consultation should have been granted as Natural England have produced a report of much greater size and complexity than any to date, with unhelpful maps to judge the proposals by, and they took more than an extra year to do it : they should be obligated to produce useable maps and allow another four weeks. Finally, while you’re at it, go to the link to this article on our Facebook page and just leave the reference to the section on which you commented. Thanks for your help! In the early days of the England Coast Path project, the Ordnance Survey were tasked with the depicting the ECP as a new National Trail, and the newly established Coastal Margin, the spreading room designated with the route, as access land. Natural England and the Ordnance Survey met before taking proposals forward, first with the MOD (Defence Estates), then with an invited “National Stakeholder Group” consisting of NFU, RSPB, CLA, National Trust, British Mountaineering Council, BASC, Ramblers, Disabled Ramblers, Stephen Jenkinson (a consultant on managing dogwalker visitors), Hampshire County Council, Open Spaces Society, English Heritage, Environment Agency, and the Rural Payments Agency. The stakeholder group met once through a “Webinar” on 15th January 2014, with subsequent emails and documents, leading to sign off around March 2014. Only one purely nature conservation based group was represented (RSPB). No representatives from National Parks interests were involved. It is unclear whether any formal discussion was held to adopt the chosen format, or whether it was presented as a fait accompli by the OS and NE to the stakeholders (the documentation available suggests but does not confirm the latter). The Ordnance Survey’s depiction decided was that the route line would be edged on the seaward side by magenta semi-circles, and all potential coastal margin as a 10% magenta shading, similar to the 10% yellow shading adopted for access land created by the CRoW Act 2000. 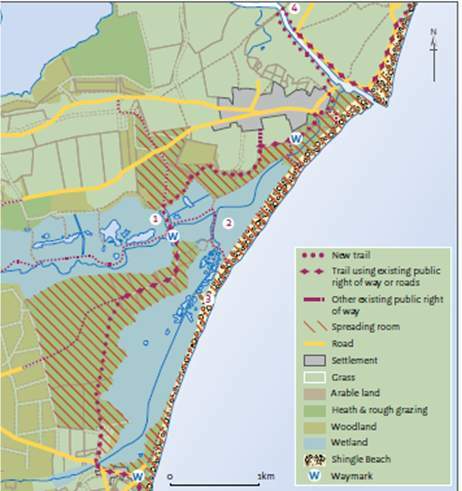 Areas that are not access land under the scheme, but which fall within the Coastal Margin, from the seaward side of the route to the water, will be shown under the magenta wash as though they were access land. That means that excepted land under Schedule 1 of CRoW Act 2000, and exclusions directed by Natural England under Section 25 Health and Safety or Section 26 Habitat Conservation of CRoW will be shown as access land, although they legally are not. There were no suggestions that Exclusions have any depiction (short of not applying the Magenta wash). There were no mention of Section 26 habitat exclusions. Based solely on a comment from the National Trust[*], the legend proviso’s language had the phrase “fragile habitats” removed as it might deter people from entering fragile habitats which weren’t off limits. The RSPB representative commented “I see little point in NE applying that procedure [Exclusion Directives under Section 25a], only then to allow OS to map it as access land.” The RSPB also pointed out that there may be future court cases S29 Reckless disturbance, bye-laws etc, where defendants may cite maps as mitigation when these areas have been depicted as access land. These concerns were palpably sidelined, with claims that accurate depiction would be too difficult, or that the cookie cutter approach would be visually confusing. At the point that this decision was made only 6 stretches of the England Coast Path had been Published and 3 Approved. The first four of these have no Section 25a or Section 26 directions. The then only recently published (Oct 2013), yet to be approved, stretches had total of 4 S25a, and 5 S26 directions proposed. Brean Down to Minehead has 2 of the S25a, but no maps of these exclusions, described solely in text. 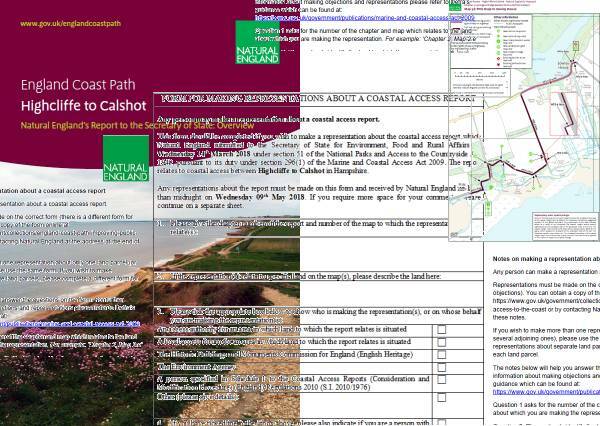 Folkestone to Ramsgate is the first report to include maps depicting the exclusions and the first to have a separate Conservation Assessment document. As these were only just published concurrent to the meeting with the MOD, it is unlikely that either of these figured in the discussion at all (especially as, despite the latter’s 5 Section 26 directions, Section 26 Habitat Exclusions were not mentioned in the Stakeholder discussions). Above right shows Coast Path as blue line, with the Coastal Margin in Magenta wash. The numbered excluded areas shown to the left are NOT depicted. Users of the OS maps would easily be led astray into all 7 excluded areas. In the absence of palpably useful and non-theoretical examples, none of those involved in the group decision had any materially significant basis to make this judgement. The decision was made without regard to National Park Purposes and Sandford. Subsequent stretch reports have required larger areas of exclusion. Subsequent policy, including the Government’s 25 Year Environment Plan have promised higher levels of protection for designated and undesignated habitats. This decision must be revisited in the light of these, including representatives of relevant National Parks (Seven Stretches are in or directly adjacent to Six National Parks [†]), and other habitat conservation organizations and land managers (including the Forestry Commission who with National Parks may be nominated as “relevant authorities” for portions of the route). Without differentiating or delineating the exclusions and excepted land, users will be mislead many into protected areas. There are weak provisos that the OS will claim covers the depiction issue (see figure). These do not even mention exclusions for habitat protection[*]. There is no guarantee that this language will even be included on all relevant OS maps, nor that they will be featured at any remarkable scale for legibility. These provisos may not be visible at all where OS data is used for mapping apps on smart devices for either the OS’s own apps or third party apps which license the OS data. Although Natural England will protest that the OS depiction is outside their remit (even as the choices given to the stakeholder group were arguably limited by OS and NE staff). NE still have the obligation to protect the coastal habitats that may be trespassed upon as a consequence of the depiction issue. Excluded areas should be the majority of the margin along our coast[‡], and should either be shown accurately, or not shown as access land at all. [‡] A conservative estimate of the current proposal would have 75% of the proposed Coastal Margin fall under no access categories of either CROW Act 2000 Excepted Land or NE designated Exclusions under Sections 25 or 26 of CROW. 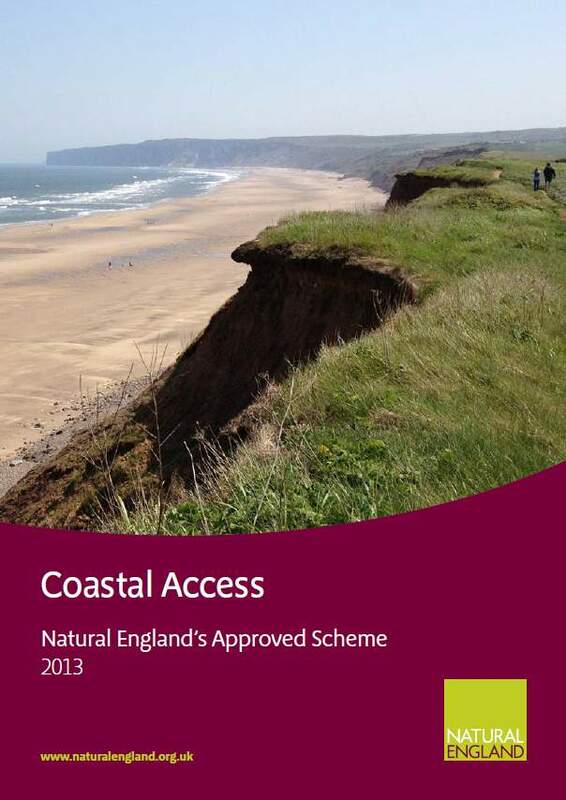 Natural England’s Playbook for Coastal Access has problems. The least of which is its ignorance of National Parks. This guidance document was mandated under the Marine and Coastal Access Act 2009 Section 298 The coastal access scheme. The first version of the Scheme (NE268) was approved on 23rd March 2010. Section 298(2) of the 2009 Act. Section 299(2) of the Act required Natural England to complete an initial review of the Scheme within three years, which they did, publishing that result 11th July 2013 (NE446). It sets out all the procedures and rules for creating, consulting and implementing the England Coast Path and related Coastal Margin. By the time they performed the first and only review to date on the guidance, Natural England had only had three stretches published [*], and only one of those approved. None of these stretches were in or adjacent to National Parks [†], the first relevant stretch coming on line over 2 years after the guidance was revised. None of the three stretches had had a full Habitats Regulation Assessment, none of them had exclusion directions from Natural England under either S25a Salt marsh and Flats or S26 Habitat Conservation. Only two had notable conservation issues of any kind. The first had an important site for Natterjack Toads, whose breeding cycle can be severely impacted by as little as one dog in their ponds, “breaking up spawn strings, flattening emergent vegetation and muddying the water” (Hesketh Ecology, 2013); Natural England’s solution: An Interpretation Panel, asking owners to put dogs on lead (just imagine how effective that would be). The second had one specific measure to avoid impact on a colony of little terns, instead of using an existing public footpath near the colony, the route briefly diverted landward the other side of a sand dune, at the same time including the lot in Coastal Margin and leaving the public foot path open. The rest of management measures on the three stretches included keeping people off a wind farm, portions of a camping park, away from boat cranes, and away from temporary events, including areas used for the 2012 Olympics. The guidance generally favours recreation including principles such as “the least restrictive option” (pg 46) wherever public access may be curtailed. Within a National Park this flies in the face of the Sandford Principle. Although the guidance suggests that NE may hand over responsibilities for the route, and local exclusions to relevant National Park Authorities “once rights have been established”, there is no mention of either the park’s special qualities or of Sandford. It is unclear whether Natural England have ever exercised the option to make a National Park the “relevant authority” for the route beyond the expectation that the Park will become responsible for the maintenance of their portion of the stretch which falls under their separate duty as “access authority”. Only two of the eight worked examples illustrated in Chapter 9 of the guidance imagine scenarios with sensitive wildlife, neither especially large. The first (Figure 28, pg 160) suggests the S25a Public Safety exclusion for Salt Marsh and Mudflats, yet offers “small areas of spreading room on flats and rock at either end of the section, which local people traditionally use as a beach and which are suitable for access.” without any concern over the effects of increased use as part of a section of a National Trail. The second (Figure 29 pg 161, and here on the right) shows a route around a wetland to prevent disturbance to birds, yet offers as an alternative a seaward section of shingle beach as allowable with small sections fenced for nesting birds, but no obstruction to anyone walking past. If the area were comparable to the wetlands and shingle beaches designated within this Park, this would not be advisable on our undisturbed shingle. A full Habitats Regulation Assessment should be carried out as a matter of course where new Rights of Way are proposed that lie adjacent or through designated habitats, with similar evaluation to existing ROW on the route where a National Trail is likely to increase traffic. Although the Making Space For Nature 2010 “Lawton” report was issued before the 2013 revision of guidance, it’s respect and concepts for nature conservation do not seem to have been inculcated appropriately in the first review. In particular, the very relevant concept of “coastal squeeze” where sea rise may force marshland inland has not been added to “Roll Back Provision” (Although NE Report Coastal squeeze, saltmarsh loss and Special Protection Areas (ENRR710) was published in 2006). Roll Back applies almost entirely to cliff edge erosion and coastal landslip, but should include other scenarios of sea rise and climate change which would squeeze habitats between advancing sea and an inland route. The 25 Year Environment Plan (A Green Future: Our 25 Year Plan to Improve the Environment), which promises greater protection for both designated and un-designated sites. These initiatives, along with the recent case which will effect Sensitive Features Appraisal (above), taken together, indicate that the slimmer or absent protections offered in the guidance should be reviewed and appropriately updated. Coastal Margin, One of the worst features of the Coast Path framework was not consulted on publicly. It’s not even defined in the Act itself. As though some inherent, received wisdom, Natural England continually refers to “Coastal Margin” as automatically including the entire seaward side of the route of the England Coast Path. But on what basis? Questioning this led me a merry chase through legislation, documentation, obscure reaches of Google queries, and a high tolerance for repetition of the term “Coastal Margin” (which you may require to read further). 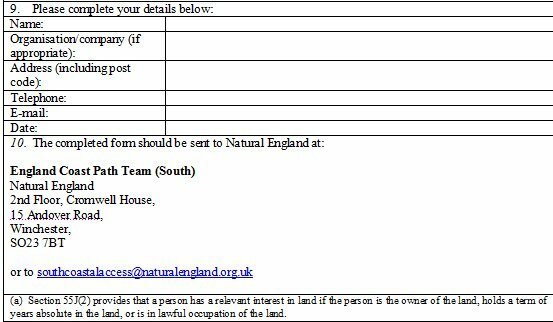 (1) Natural England and the Secretary of State must exercise the relevant functions in order to secure the following objectives. (b) (except to the extent that it is completed by ferry) passes over land which is accessible to the public. (3) The second objective is that, in association with that route (“the English coastal route”), a margin of land along the length of the English coast is accessible to the public for the purposes of its enjoyment by them in conjunction with that route or otherwise, except to the extent that the margin of land is relevant excepted land. 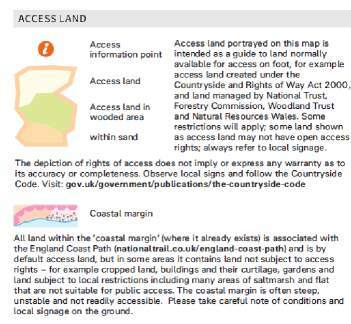 Here it only refers to the context of it as an objective of “Coastal Access Duty” and states the purpose of “a margin” for public enjoyment in conjunction with the route. The act then bandies the term “Coastal Margin” about quite a bit (55 times), but mostly the references are about how to treat and what you can do with Coastal Margin. You can as a landowner dedicate land as Coastal Margin, if it already adjoins a Coastal Margin. When Coastal Margin access rights come into effect (only once the route stretch is fully implemented). That Natural England may align a landward portion of Coastal Margin with a physical feature. You’ll be hard pressed to find a definition, but from context in section 296 you may glean that Coastal Margin is related to the route, and elsewhere that it may have landward and seaward sides. Finally the search brings you to what looks like Section “55D Coastal margin” but this in turn is a shell game, 1) the section goes on to describe how Coastal Margin may be treated within the report prepared under Section 51, 2) the intrepid reader may already be wondering ‘weren’t we just in Section 296? have we gone back in time?‘ in a way, we have, we’re actually in Section 302 Long Distance Routes which does two things, both insertions into the 1949 Act which means the National Parks and Access to the Countryside Act 1949, into which Sections 55A-J are dropped betwixt that Act’s Sections 55 and 56, and then Schedule 19 of 2009 is transported to Schedule 1 of 1949 (all without recourse to TARDIS). Of course, all you Hansard habitués know that this refers to the Countryside and Rights of Way Act 2000 (c. 37) (aka CRoW 2000), and like me, you’ve a rolled up copy of the original either under your pillow, or propping up that short table leg. If you look there, you won’t even find the word “margin”. Maybe we’re going about this from the wrong direction, we’re trying to find the source of a definition that tells us that the coastal margin is the entire seaward side of the path. CRoW doesn’t have the word seaward in it either. The 2009 act mentions “seaward” 31 times, it’s used throughout relating to various definitions of limits of territorial waters. In Part 9 Coastal Access the term in used for stipulations within Section 301 River Estuaries such as “relevant upstream waters” is partially defined as “the waters from the seaward limit of the estuarial waters of the river upstream to the first public foot crossing”. “Seaward” is only used in conjunction with “Coastal Margin” when discussing the notion that an alternative route may have the default spread of 2 metres both landward and seaward, with discretionary additions of physical features on the landward side. Aren’t you glad you asked? (b) land adjacent to the foreshore (including in particular any cliff, bank, barrier, dune, beach or flat which is adjacent to the foreshore). (1) The Secretary of State may by order specify the descriptions of land in England which are coastal margin for the purposes of this Part. Oh, it didn’t, but it finally mentions “coastal margin” in a prescriptive manner and tells you that the Secretary of State may specify the description by order. It’s really the legislation’s way of saying “put a pin in it.” This means the definition of coastal margin in use was never consulted upon publicly leading to the legislation. 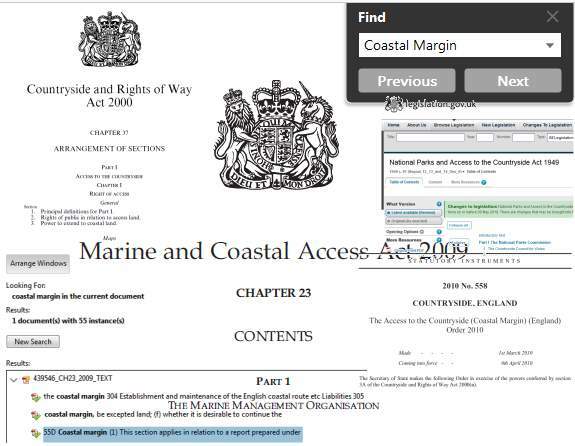 The amendment made by the 2009 Act only appears in the “live” version of the Act on the legislation website, but not in any printed or downloaded versions (https://www.legislation.gov.uk/ukpga/2000/37/part/I/chapter/I). So the definition isn’t in any of these Acts, the “pin” saying they’ll get back to us on that one is. It is then created by a subsequent statutory instrument, the “order”. the Order has no explicit scenario to reflect what to do with the coastal margin should the “coastal land” the foreshore etc., be excluded for habitat or safety reasons, it should not follow that the margin leading up to excluded areas should be included. Natural England have the option to terminate the path either side of an estuary, but avoid this to keep the route contiguous and not create demands for honey pot infrastructure and the terminal points. If you look at the inland habitats woodland etc that are included in coastal margin, woodland etc, despite the foreshore of the entire estuary being excluded under S25a Salt Marsh and Flats, the absurdity becomes more apparent. Thank you to all of you who made it this far. I should probably ask if you know which shell the pea is under, or if you followed the lady. We are left with two problems, the impenetrability of the act helped hide a vital detail until after it was passed, and the interpretation of this detail is open to question. Also coming soon, more on how estuaries fare when Natural England gets to decide that they’re the sea. 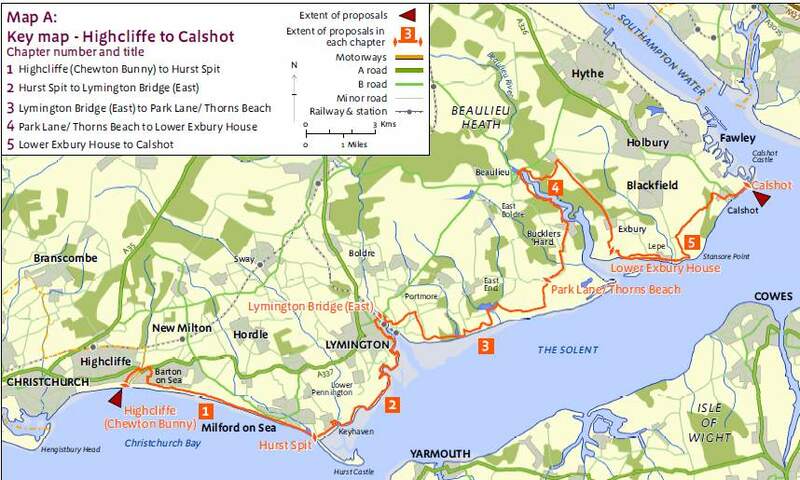 The consultation on the Highcliffe to Calshot stretch of the England Coast Path closes on Wednesday 9th May. We’ve been discussing the possible negative impacts of the proposed route since 2016 when it was mooted that this Consultation would happen in March 2017. We’ve shared some aspects here through presentments to the Verderers, statements to the National Park Authority, and our letter to the Access Forum. However, it’s worth putting the project into perspective, what it is and why we’re concerned. We’ll start with this overview of the bare basics. The Marine and Coastal Access Act 2009 mandated the The England Coast Path (ECP). The Act’s other aims created a new Marine Management Organisation, made alterations to marine licensing and fisheries management, and provided the set up for marine conservation zones. In addition to the establishment of an English coastal walking route, it also included rights of access to land near the English coast. So far, so benign. There are existing Coastal Routes, the South West Coast Path, Norfolk Coast Path, Wales, etc. and here the Solent Way. To a certain extent it hardly seems necessary. The key problem comes from the creation of requirement known as “Coastal Access Duty”, including not just providing the route, but also the creation of new access land called “Coastal Margin”. Coastal Margin was left undefined in the 2009 legislation, but since has come to be broadly defined as the entire seaward side of the route (with certain exceptions, and possible discretionary landward additions). That definition encourages land owners to allow the path placed as close to the coast as is practical. This becomes problematic as our coast includes a nearly uninterrupted series of highly designated and protected habitats of international importance alongside which the route will necessarily skew inland. Sending the route inland to avoid habitat, has the simultaneous effect of designating that habitat, seaward of the route, as access land, which defeats the purpose of avoidance. Some land, such as arable, private buildings and their curtilage, are considered “Excepted Land”, and Natural England have the discretion of creating “directions to Exclude” on the basis of habitat or public safety, together these are the slim protections from Coastal Margin access. Creation new non-historically based Rights of Way and joining up of existing routes, increasing their use will impact on tranquility and habitat disturbance. There is funding for path upgrades, signs and rudimentary barriers, but no funding for parking, other infrastructure, or any other mitigation measures (as a developer creating the same access would be required to provide). Some stretches, near or on small country lanes in the most remote parts of our coast would exacerbate the verge parking problem. Signs explaining exclusions will not make up for the Ordnance Survey’s decision (with the alleged fiat of a “stakeholder group”) to show all potential Coastal Margin as Access Land, disregarding whatever Excepted Land, or Exclusions may be in place. 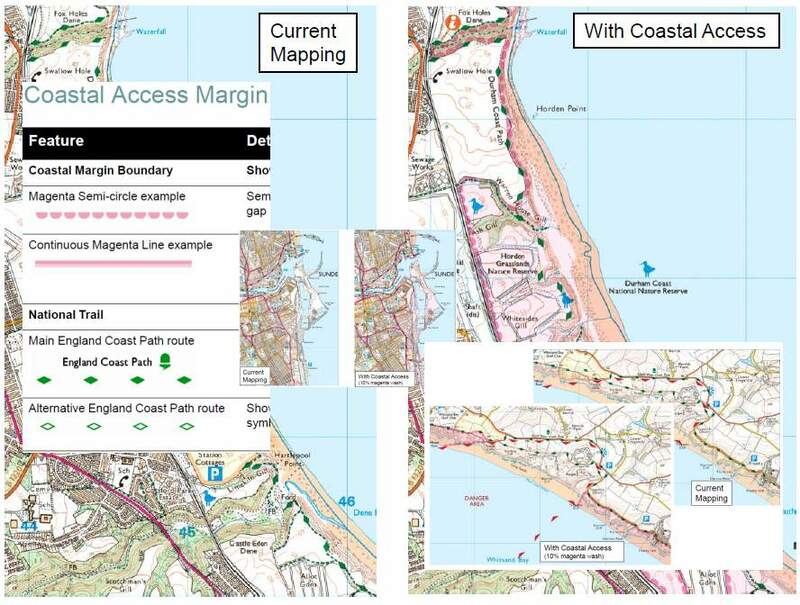 A conservative estimate of the current proposal would have 75% of our Coastal Margin fall under these prohibitions, but the Ordnance Survey will show them as access anyway, despite their standing as providers of a definitive map. In the current proposal Natural England have not sufficient excluded our designated habitats and have created new Rights of Way adjacent and through SSSI designated land. They have not made directions for dogs on lead aside or through habitats, or land used for livestock including back-up land vital to commoning. They have not provided maps that show the vital spatial relationships of the route to protected, vulnerable or excepted land. The Sensitive Features Assessment for our coast is the largest of the 31 stretches published to date. At 222 pages it is twice the size of the next largest, and five times larger than the average (excluding itself). The report is fraught with inaccuracies and errors, including misquotes from some of our ecologists. Natural England have not performed a full Habitats Regulation Assessment to judge the impacts, they use a get out from their own guidance which allows them to conclude that their own mitigation proposals (signage, willow screens) are sufficient. That self determining logic was just slammed in the European Court in April (the judgement required that full HRA be performed). The guidance creates a principle, not based in the legislation of “least restrictive option” for conflicts between Coastal Access Duty and other interests, including habitat, favouring recreation, where in a National Park, the Sandford Principle, enshrined in the legislation would indicate the opposite. The over interpretation of Coastal Access Duty, particularly the Margin, by Natural England shows no regard for the National Park Purposes or Special Qualities. It also fall far short of subsequent policies, including the Government’s flagship 25 Year Environment Plan. 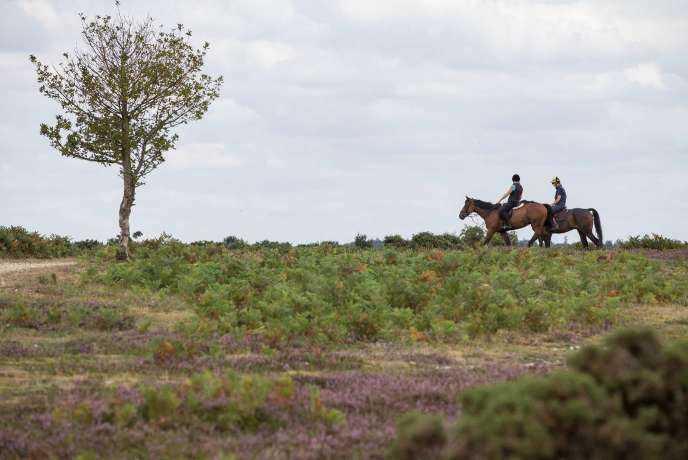 The particularly large size and sensitivity of the New Forest Coast was clearly not foreseen by those framing the legislation, which is ill suited to application of its subsequent all encompassing Coastal Margin definition. Natural England have not provided adequate proposal for consultation, including poor mapping, inaccurate and incomplete Assessments. The poor decision by the Ordnance Survey to serve up protected areas as accessible is a gross misrepresentation. Taken together, and in some cases separately, this will lead to unacceptable damage to habitats. All the worse, as it should be avoidable, not intentionally planned. What’s At Stake : Our Coastal Habitat, how precious it is, how you might not have known that. Consultation and Complexity : How is our stretch more difficult? Margin of Error : When is something inland somehow part of the Coast? Up An Estuary, Without a Paddle : No one really knows what to do about an Estuary. Sense and Insensitivity : What happens when Sensitive Features Appraisal doesn’t live up to its title? Do we need it? : In which we might have to argue with a Rambler (no one wants to do that). Error: Error validating access token: Session has expired on Sunday, 10-Mar-19 01:16:56 PST. The current time is Wednesday, 24-Apr-19 23:13:35 PDT.